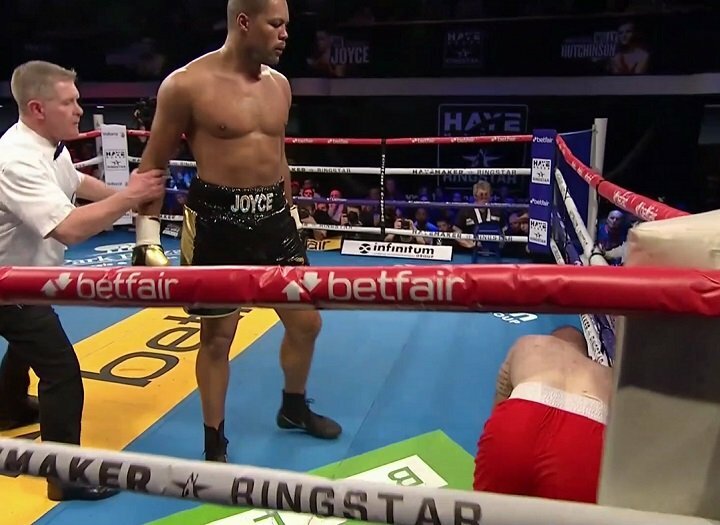 Joe Joyce set himself up for a potential showdown with Dereck Chisora after his devastating win over Rodolf Jozic in the main event of the Hayemaker Ringstar Fight Night — live on free-to-air entertainment channel Dave. In only his second professional fight, the Olympic silver medalist claimed his second victim with a first round stoppage at York Hall. Fellow Ringstar stablemate Willy Hutchinson produced a hearty performance to put Eric Mokonzo away on points and extend his perfect start to life as a professional fighter to 3-0. The Scottish teenager, 19, flew out of the blocks with a series of ferocious punches. The onslaught continued into the second with Hutchinson underlining his exciting potential, landing a barrage of heavy blows. Yet Mokonzo stood firm and traded back in the third when he shook the teen with a fierce jab to force a bloodied nose. Hutchinson, backed by a lively Scottish contingent, recovered well and forced the referee to dock his opponent a point for holding on in the fourth. Patience proved a virtue for Hutchinson as he made a breakthrough to knock down the local Bethnal Green fighter in the fifth. And ‘Braveheart’ Hutchinson eventually ended Mokonzo’s resilience to score a deserved, unanimous decision from the judges after six action-packed rounds. Elsewhere on the Hayemaker Ringstar card, Islington welterweight Freddy ‘Pretty Boy’ Kiwitt pushed Mitcham’s Jumanne Camero to the limit in a cracking contest, claiming a 78-76 win on points. London lightweight Mo Gharib, 25, opened the evening with an impressive 40-36 points victory over Devon’s Jamie Speight to extend his unbeaten start in the professional ranks to two wins from two. Hayes welterweight Jack Newham, meanwhile, was another young fighter to display his promise. The 21-year-old was put to the test but overcame Jan Korec, 40-36 on points. His record now stands at 3-0. Fellow welterweight prospect Sam Gilley delighted the East End crowd as the local Walthamstow boy defeated Daniel Bazo. The 23-year-old delivered a fearsome right hook to send Bazo to the canvas early on in the second.He then floored Bazo once more before the Czech fighter’s corner retired him ahead of the third round.‘Magic Man’ Gilley‘s record remains unblemished at 4-0. Anesu Twala also protected his flawless record, moving to 4-0 following his 40-37 super lightweight points victory over Cardiff’s Rhys Saunders. The Zimbabwean-born Lewisham fighter, 26, lived up to his ‘Bad News’ nickname in a dominating display. Dean Richardson dispatched Czech veteran Jan Balog to stretch his perfect record to 6-0. The Middlesex welterweight looked a class apart and claimed a convincing 40-36 landslide with the judges. And Luton‘s Linus Udofia saw off late stand-in opponent William Warburton in a 40-36 points win to improve his record to 7-0. You can re-live all the action on free-to-air UKTV catch-up. Catch up on all the action from tonight’s fight on UKTV Play. Ringstar Sports to live stream Hayemaker Ringstar fight card today! Hayemaker Ringstar, the partnership between two-weight World Boxing Champion, David Haye, and world-renowned promoter, Richard Schaefer, will be on hand for their second televised ‘Hayemaker Ringstar Fight Night’, on February 16th at York Hall in London. Headlining the show will be Olympic silver medalist Heavyweight Joe ‘Juggernaut’ Joyce who entered the professional ranks in emphatic style in October. Announcing his debut against former WBO Inter-Continental Champion Ian Lewison, many saw this as an unnecessary risk for Joyce but aged 32 he has no time to waste and promoters Haye and Schaefer are looking to fast track him to Title fights. From the first round Lewison struggled with the sheer power and sizable engine of the ‘Juggernaut’. A heavy left in the eighth caused Lewison’s corner to throw in the towel and the contest was waived off 2 minutes and 35 seconds into the round. Joyce now faces the 25-year-old Rudolf Jozic 4-1 (3KO) from Croatia. Jozic is a heavy hitter and will no doubt be looking to add to his knockout record on February 16th. Richard Schaefer added “February 16th is set to be a great night for the Hayemaker Ringstar stable, both Joyce and Hutchinson are huge talents and future stars of the sport. I watched Joyce sparring in LA earlier this week and without question he is a force to be reckoned with. I anticipate a tough night in the office for Jozic.